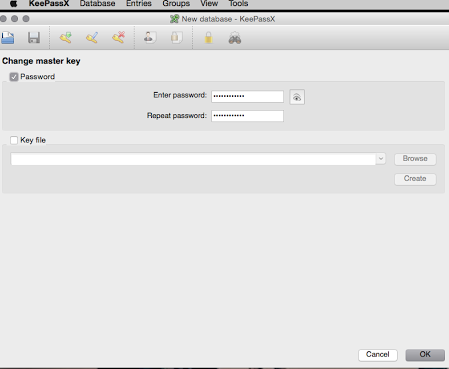 With KeePassX you can store your password in a secure, portable, password protected database. Its advantage is that your passwords will only be available locally on your computer or data storage, which reduces the risk of unwarranted access. The disadvantage of this method is that the software cannot automatically fill your login details on the websites. Instead, you have to copy and paste the data yourself. 1. Download the package for Mac OS X from https://www.keepassx.org/downloads/. 2. Open the file, which will appear under Devices. 3. Drag and drop the KeePassX icon to Applications and remove it from Devices. 4. Launch the software from Applications. 5. Use Database – New Database to create a new database which will store your login data. 6. Next you need to set a password, a so called master password, which will grant you access to the passwords saved in the database. Setting a master password will at the same time encrypt the contents of the database..
7. Now save the password with Database – Save Database. 8. You can add new entries with Entries – Add entry. Use the “Title” field to indicate the name of the application the password belongs to (such as Gmail). Give your username and password. If you would like to change the existing password to a stronger one, click on the “Gen.” icon. 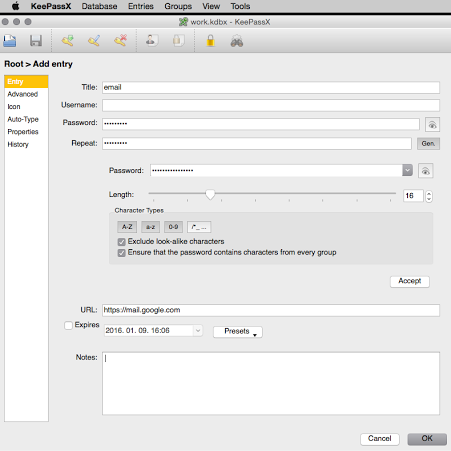 KeePassX will automatically generate a new password, which you can keep by clicking ”Accept”. You can check it using the … icon. Don’t forget to replace your existing password with the new one in the service in question. 9. You have the option to organize your passwords into groups (such as E-mail, Social media). You can create new groups with Groups – Add new group. 10. 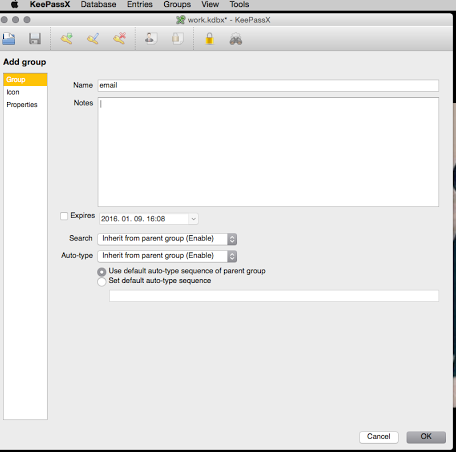 You can drag and drop the entries to the groups you wish to store them in. You can add a new group with Edit – Add group, and edit the existing ones with Edit – Edit group. 11. 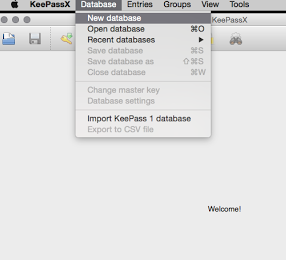 When signing in to a webpage, go to the relevant entry in KeePassX and open the dropdown menu with Command – click. Choose “Copy Password to Clipboard” and paste it in the login form of the webpage.